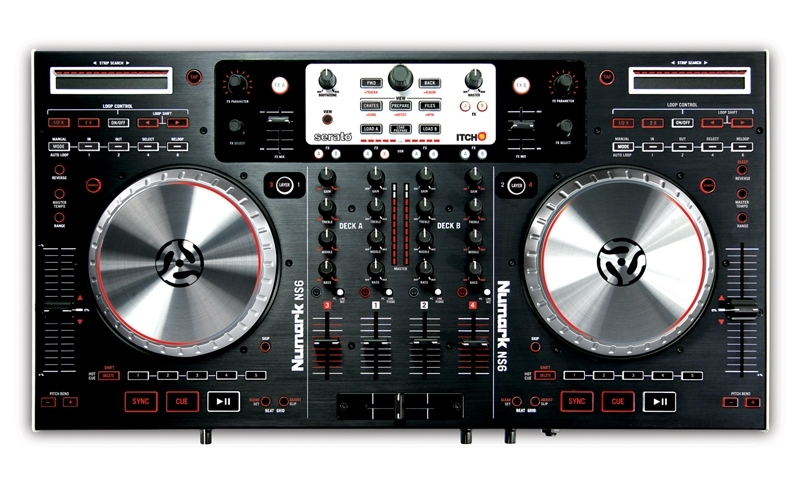 When it comes to 4-deck DJ controllers, NS6 is the serious choice for DJs. Employing critically acclaimed technologies and designs introduced by the Numark-Serato partnership that produced the NS7, NS6 continues the tradition of quality and performance while adding a full-blown 4-channel mixer and four deck capability to the mix. Every component of NS6 was engineered with exacting specifications to give you the feel, response and capability you’ve come to expect from Numark, along with some pleasant surprises you may not have expected. The platters on NS6 are ultra sensitive, responding to your touch. 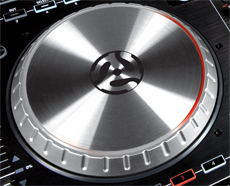 These are not “forced depression” platters that demand you press down every time you want to move the platter or scratch; the NS6 platters are the most responsive, high-resolution touch-activated platters ever produced in a DJ product, delivering an astounding 3,600 ticks of resolution per rotation. NS6 has all metal construction but isn’t a back breaker; it’s built to be the most solid, portable controller available. You’ll have no trouble getting NS6’s rugged, brushed-metal body into backseats, trunks, or small DJ booths. Carrying NS6 a few blocks to a gig is no problem, and when you set it down and begin a set it’s ready to make your presence known. At the heart of NS6 is a premium quality, fully independent four-channel mixer. This isn’t just a mixer for ITCH's four decks; you get a full range of inputs and outputs for connecting virtually any device: RCA inputs on each channel and four line-level inputs with two switchable to phono and two switchable to mic. Each of NS6’s four channels has an input selector so you can easily transition between controlling ITCH's four decks and your external sources. Control ITCH one moment, mix in your turntable, iPod, or a mic in the next. NS6 makes it possible to grab music from virtually any source and bring it into your mix. With other controllers, if your laptop goes down, you’re done, the show is over. Not with NS6, it doesn’t process external signals through your laptop, so when you plug in external sources the sound comes directly out; NS6’s mixer works like any other high-performance DJ mixer from Numark. Connect a CD player, MP3 player or even your phone, and you have a stable back up, ready to go at a moment’s notice. With all this connection and mixing capability, NS6 is the ideal controller to use when tag-teaming with other DJs. When you bring your gear to a gig, you want it to sound the best it possibly can. When a venue has invested in pro-grade XLR connections, you should be able to take full advantage and with NS6 you can. NS6 has locking XLR outputs for a truly pro-quality signal that will relay your mix reliably even over long distances. RCA outputs are also on-board, enabling you to set up in a variety of configurations. Connect two CD players, two turntables, two mics – the combinations are endless and completely up to you. NS6 was built for DJs who want to take charge of any venue, immerse themselves in the music, and not be confined to a laptop interface alone. NS6 is a software controller, but it’s equally ready to handle everything else you’ve got. With an all-new 4-deck version of Serato ITCH, NS6 gives you an unbelievable amount of options for performing. ITCH’s interface lines up all four tracks, one on top of the other, so you know exactly where you are and can easily see how the tracks coincide. Remix a track on the fly, layer effects, mix and match components from four different songs – NS6 is a true DJ’s dream. Test it’s limits, see if you can even find them. NS6 continues in the tradition of NS7, NS7FX and V7 by giving you tangible control and visual feedback of your software. You’ll spend more time performing, less time looking at the screen. The layer selectors are the keys to unlocking the 4-deck power of NS6. At the push of a button, you can switch between Decks 1 & 3 on the left side and Decks 2 & 4 on the right. Grab a keyboard loop, bass line, drum track and vocal, all from different songs, and create a totally new one – NS6 has capabilities that empower you to go beyond remixing. You have to hear it to believe it. By depressing the Skip button and turning the platter you can get to any point of your track in seconds while staying on the beat. You lose no energy and hear no rushed transition. It’s like a musical time warp. The Beat Grid function gives you the ability to manually adjust the beat grid of any song, so when you loop or Beat Sync the track everything is seamless and tight. The included D-type Slim crossfader was custom built for the NS6. This isn’t just a standard volume fader turned sideways. This crossfader was engineered to give you smooth control with just the right amount of resistance. Use the Contour Adjust and Reverse Adjust controls to dial in the response you prefer. 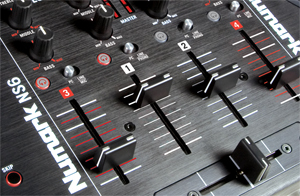 Strip Search, the virtual-needle-drop technology invented by Numark, has been enhanced on the NS6 to include bi-color LEDs that tell you exactly where the track is. There’s no guesswork, you’re in total command. Never before has a controller given you this much control and capability. A 4-channel mixer plus 4 decks of control with effects and legendary Numark pro-grade construction, NS6 has arrived and it's going to change everything.